Planned Parenthood Opponents Talk Government Shutdown After Bill Fails : It's All Politics An effort to strip Planned Parenthood of federal funding failed in the Senate on Monday, but the fight isn't over. That was only the opening volley in a larger funding battle to play out in September. "I don't like a government shutdown, but this is a clear case of totally improper use of taxpayers' dollars. I have an obligation to the taxpayers of Arizona," said Sen. John McCain. He had scolded his Republican colleagues in 2013 for shutting down the government over the Affordable Care Act. He says this issue is different. The uproar over sting videos alleging Planned Parenthood illegally profits from selling aborted fetal tissue has only just begun on Capitol Hill. Republican and Senate Judiciary Chair Chuck Grassley said Tuesday he has opened an inquiry into Planned Parenthood's "facilitation of activities described in the videos." The House Judiciary Committee had announced last month that it would investigate the organization as well. And on Monday night, a bill that would block all federal funding for Planned Parenthood failed in the Senate. But that vote was only the opening volley in a larger funding battle to play out in September. It takes a special kind of issue to make threats of a government shutdown even halfway credible on Capitol Hill. Not just any controversy will fly. Genuine government shutdown potential requires an issue that taps into a deep well of anger. It must be an ideological litmus test lawmakers can't easily wriggle out of. It seems Republicans are now coalescing around just that kind of issue. The ultimate of all litmus tests — abortion. "This is not about Cecil the lion. This is not about whales at SeaWorld. This is about children," said Republican Sen. James Lankford of Oklahoma, who helped push a bill to strip federal funding from Planned Parenthood. That bill failed Monday. But it was simply Act 1 for even bigger drama coming in September. That's when government funding expires, and a chorus of Republicans have already vowed to reject any funding measure that contains money for Planned Parenthood. "We should use any and every procedural means we have available to end funding for Planned Parenthood," said Republican presidential candidate Sen. Ted Cruz of Texas. And if that means a government shutdown, then, so be it. "I don't like a government shutdown," said Republican John McCain of Arizona. "But this is a clear case of totally improper use of taxpayers' dollars. I have an obligation to the taxpayers of Arizona." McCain had scolded his Republican colleagues in 2013 for shutting down the government over the Affordable Care Act. And then he told them to ditch shutting down the Department of Homeland Security over the president's executive action on immigration. But McCain says this issue is different, and Democrats would be unwise to block their efforts. 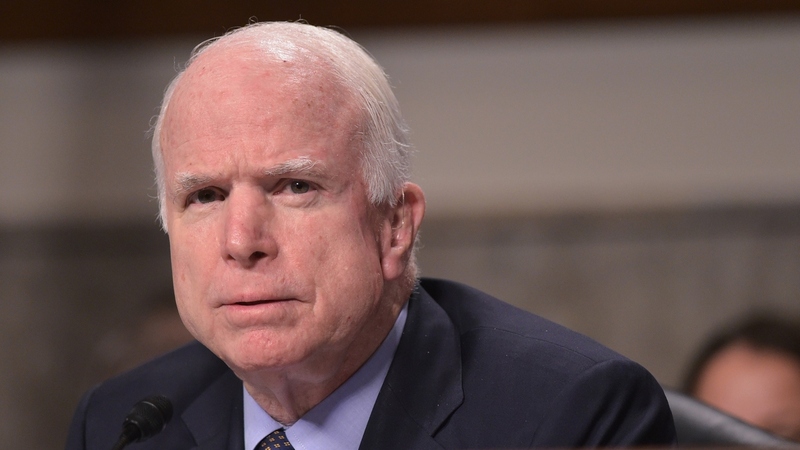 "If they want to stand before the American people and say that they support this practice of dismembering unborn children, then that's their privilege," said McCain. But Democrats who say they're concerned about the videos, too, are perplexed at the Republican strategy. They point out Planned Parenthood is already banned from using federal money for abortions, except in rare cases. And Claire McCaskill of Missouri says defunding a group that provides contraceptives will only increase abortions. "If I want to reduce abortions, which we all ought to agree on, the dumbest thing we can do is to cut off access to birth control. And that's exactly what the Republicans are trying to do," said McCaskill. Republican leaders haven't yet said whether they'll consider the strategy. When Mitch McConnell took over as Senate majority leader this year, he promised he'd oversee no government shutdowns under his tenure. Meanwhile, some Democrats seem to be taunting their Republican colleagues to try shutting the government again. "Have Republicans learned nothing? They tried to do this over [ACA] and had to walk away weeks later with their tail between their legs," said Chuck Schumer of New York. "Ted Cruz said, 'Follow me.' And they followed him for three weeks. Till they got to the very edge of the cliff. Are they going to do that again?" Republicans will have the monthlong August recess to mull that over.